The M/V Warnow Sun is part of ARRC’s multi-cargo handling vessels. ARRC service carries breakbulk, project cargo, vehicles, containers and heavy lift between Russia, Belgium, and the US. ARRC breakbulk service requires a diverse skills from heavy lift know-how to container operations. 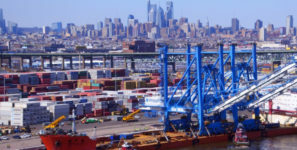 Atlantic RoRo Carriers Inc. (ARRC) had its first vessel call at The Port of Philadelphia’s Tioga Marine Terminal last week. The M/V Warnow Sun is part of ARRC’s multi-cargo handling vessels of breakbulk, project cargo, vehicles, containers and heavy lift ability operating between St. Petersburg, Russia; Antwerp, Belgium and the United States East and Gulf coasts.